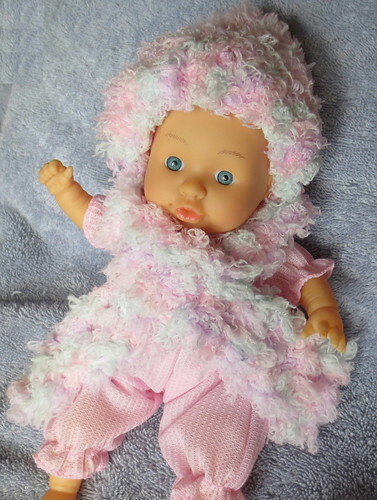 Here are a few baby doll fun fur projects I crocheted. 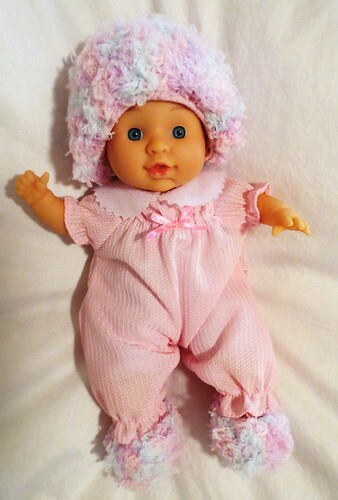 I crocheted a hat and booties for this 11 inch small baby doll. 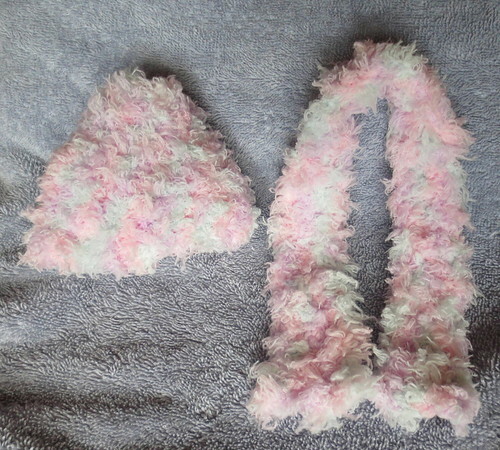 I also crocheted a little matching scarf to go along with the doll set. I didn’t really follow a pattern for the hat but started with a H (5 mm) crochet hook with a chain of 3 and joined to make a circle. Next I worked 6 single crochets (SC) in the ring, and next round I worked 2 SC into each stitch (12). Then next round, work 2 SC in next stitch and then 1 SC in next stitch, repeat around. I evenly increased to about 28 stitches for the hat and worked even a round or two so it fit my small baby doll as shown. Finished size is 4 inches long with a 9 inch circumference. This isn’t written as a precise pattern directions as you have to just check the hat as you go along to make sure it fits your particular doll’s head and you get the size you need. Working with fun fur is hard to find each stitch so I just focused on getting the fit I needed rather than the stitch count. So just improvise as you work the rounds to get the size and look you desire for your doll. For the booties, I chained 3 and joined into a circle. Then I worked rounds of increases to fit my little doll’s foot. Depending on your doll’s foot, your size will vary but with a H (5 mm) crochet hook, I worked 4 single crochets (SC) to the circle. Next round, 2 SC into each stitch, then worked even for a few rounds. 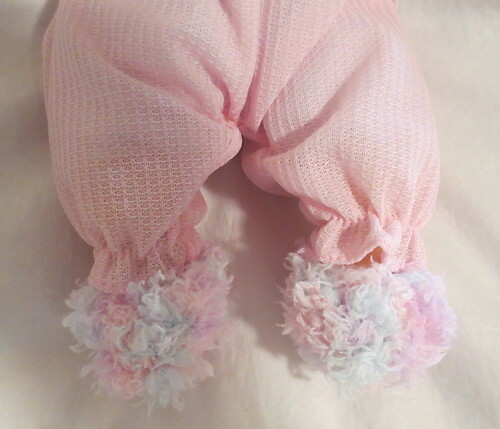 I finished off the final round very tightly so I could just slip the bootie over the doll’s foot. Scarf directions: Chain 7 and SC in 2nd stitch from hook. Work even on 5 stitches, chain 1 and turn each row. I continued working even on 5 stitches and crocheted the little scarf to 17 inches long. The scarf is about 2 inches wide using this pattern. So this completes my fun fur baby doll winter set. The baby doll will be going to local charity where some little girl can enjoy her.